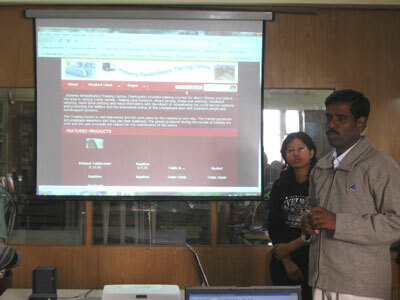 At Fair Trade Forum India’s Annual Convention a few months ago I heard Surendra Sahi from OpenEntry speak about free websites powered by them but managed completely by artisan groups using Google spreadsheets. It sounded too good to be true so I investigated further and asked some of our groups if they were interested. When he heard about the training Pierre from KKM wrote back “Something like this has been promised in the past but it has never come to anything; we have such stories to tell about our history and our people.” Wangchuk Gyalpo from IMEX asked if another non-MESH, Tibetan group could come along too. Last week we held an OpenEntry website training for eight supplier groups and Madan Lal who is MESH’s Fair Wages trainee. 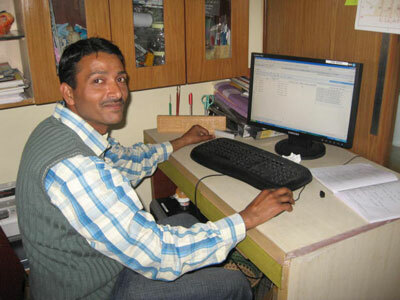 Ram Keseri (Richa) from OpenEntry conducted the three day training using basic templates set up by Surendra and his team in the OpenEntry support office in Nepal. It was the first time Richa had conducted such a workshop alone but she was delighted with the results…every group prepared a website which they presented to the other members of the group on the last day. Of course there are things to iron out but they are all to do with spelling and use of coloured fonts and adding images; no one encountered problems using the systems and everyone mastered the use of basic HTML tags to format text, add images and links etc. Using Skype from Nepal, Surendra Sahi conducted a session on e-commerce and appraised us all of the need to be clear about the purpose of our websites. He also raised the subject of MESH forming a Market Network of crafts groups whose members are disabled of leprosy affected. There is much to consider. MESH already has this website but the template for products is better on the OpenEntry site so we shall create a link and make viewing and managing our product pages a better experience. I think we might also begin to try and sell on-line, at least within India. The workshop was conducted in MESH Design Studio; we were blessed with almost uninterrupted electricity (just one small power cut) and even had a good Skype connection. Connectivity was a little slow as we stretched our WiFi configured for eight computers to cover thirteen, but that did not prevent anyone from working. The next step for MESH is to get Madan Lal busy on our products pages uploading our latest catalogue and gradually, but in a focused manner, including all our products. Then perhaps a section for online sales can be opened. I shall be encouraging all the groups to finish their sites and hopefully in a few months we shall be able to include links to all the other sites with their stories, news and products. Many thanks to IM Soir whose funding of our Design Studio made this workshop possible.